I understand there can be a lot of work setting up JACK without it fighting the default sound server. Can someone give me a step-by-step method for what I need to do to plug in my midi machine and hear music when I press keys as simply as possible (without messing up pulseaudio, ie, so I can still access Skype and ordinary desktop stuff)? I'm fine installing JACK, but I'd like to sandbox it a little if it has the chance of messing up regular desktop. If you just want to get your keyboard to play sound, this is very simple, and you won't need JACK nor Rosegarden for that. These tools are great if you want to record MIDI signal, write notes, and route audio between separate applications, but you don't need that to play sound with your keyborard. Plug in your MIDI device to your computer. If that's a USB MIDI keyboard, just plug the USB, if it has only MIDI plug, you may want to use a MIDI to USB device. Download/Install a synthesizer. 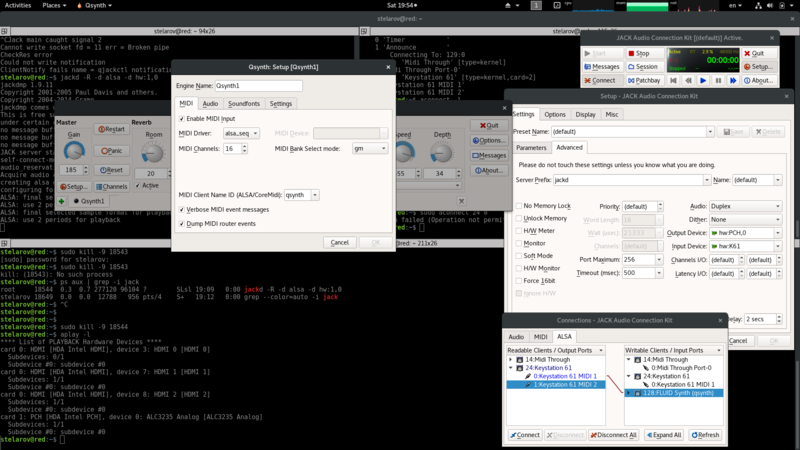 There is a large variety of sound synthesing applications for Ubuntu. You may like ZynAddSubFX (really powerful one), FluidSynth or QSynth (support soundfonts), AMSynth, AMS. Make sure to browse Ubuntu Software Center for synthesizer that will grab your interest. Launch the synthesizer. Of course it has to be running to produce sound. Press a key on your keyboard. You will hear some sound! If not, make sure if your system sound is not muted, and that our speakers are connected. Also, some synthesizers require you to choose an instrument before they produce any sound. Fine tune your synthesizer settings. You will most likely not enjoy the initial sound of the synthesizer. In case of ZynAddSubFX, this will be a plain sine wave, boring! However, you can easily browse a great collection of timbres, and you can customize them fully. All synthesizers provide you lots of customisation, it's worth to spend some time choosing what you like most. Proceed to play. Good luck and have fun! I have also once written an article on general workflow for music production with external keyboard on Ubuntu, it should be useful in your case. Here's the link. I don't know about Rosegarden, but you can run qjackctl from the package manager. Amsynth is an easy little way to make sound midi->jack. I don't know how to run jack and pulseaudio at the same time - ie running chrome through jack (looking into it right now, actually). My experience in 12.04 is easy so far to make sound. At this point, you should be able to play notes from either your external MIDI controller or from the virtual piano GUI (the GUI works even if you don't have an external controller). From the Keyboard GUI you can select different instruments (see Program). From the Qsynth GUI you can manipulate the volume (see Gain) as well as Reverb/Chorus effects. There is also a Panic button in case the reverb goes off the rails. This was specifically tested on clean install of Ubuntu Studio 18.04, but similar steps worked for Ubuntu MATE 16.04, with a notable automatic configuration difference being that Qsynth -> Setup -> Audio -> Audio Driver defaulted to jack in Ubuntu Studio but to alsa on Ubuntu MATE. On both 16.04 and 18.04, I have experienced weird static when Qsynth initially starts working with alsa. This static seems to affect all audio sources, but it somehow works itself out in a minute or two (at least partially). I later tried this setup on a less powerful CPU and noticed a similar static that did not seem to resolve over time. [As an aside, I noticed that this static correlated with the ALSA plug-in [qsynth] line glitching in and out in the Applications tab of Sound Preferences]. Apparently, the CPU can't always keep up with the required burst rate, so a little extra buffering is needed to prevent underruns. Presumably the are other settings that could also affect this. vmpk loses its connection to Qsynth when the settings are changed. The quickest way to experiment with changing settings is to close and restart vmpk to force a reconnect. Open up qsynth and go to Setup. In MIDI tab, I select Midi Driver: alsa-seq. In Audio tab I select Audio Driver: jack. 4.1 Go to Connect -> ALSA. In the left column find out your keyboard and connect it to qsynth that lies in the right column. Also make sure that in the first column (AUDIO), qsynth is connected to your speakers (right column). PS: In this scenario no other application can use the speakers at the same time. Not the answer you're looking for? Browse other questions tagged 12.04 sound pulseaudio jack midi or ask your own question. What changed with timidity, alsa and jack in 11.10? How to do advanced MIDI keyboard routing?